While swapping out my wheels and tires on the flatty, I was going to do a brake job. The brakes have always been a little noisy (not squeal/squeak.....almost an audible grinding when coming to stop) so I was just going to put on new pads. However, on inspecting the pads they look brand new with almost 1/4" of friction surface left....and the backing plate and sides of the friction surface are red???? Only company I know that does that is EBC with the old "Red Stuff" pads out of England, and I never thought they did pads for a SQ. That could explain the brutally fast braking the flatty has always had, and it spent a few years in Europe with the PO. Anyone ever seen EBC Red's for our cars? Yes EBC made pads for our cars in Europe. It's possible a previous owner ordered some from there. There's an EBC warehouse in san fernando, CA. No need to order overseas. Look for toyota pickup and tacoma front pads if you don't find SQ listings. Toyota pickups use the same pads. 1982 to 1995 Toyota pickup is the year you might be able to find the pads for. Yeah I got EBC pads for mine.... but there not the reds, there organics so I think the greens? When I ordered them they were for a Toyota something. It was whatever was listed in the posting at the time. I couldn't find EBC under those year pickups on rockauto. look up 99 toyota tacoma v6 or 4cyl. It's in the ebc catalog. Oriely claims that truck uses the same pads as a SQ. I have a 96 tacoma 4 cyl 2wd. 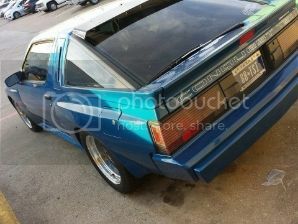 I just did brakes and saved an old pad to check it with the factory starion ones. Does anyone have a set of pads lying around to take measurements of? I have a micrometer and can get the measurements of the toyota pads. This way we know 100% if they will work or not. The 96 year was the start of the new generation of tacomas which went until the early 2000's. Already done. I used some SQ pads I bought from rock auto years ago on my 91 toyota truck. Same pads. Thank you import warrior. this should be stickied. in the FAQ I believe. 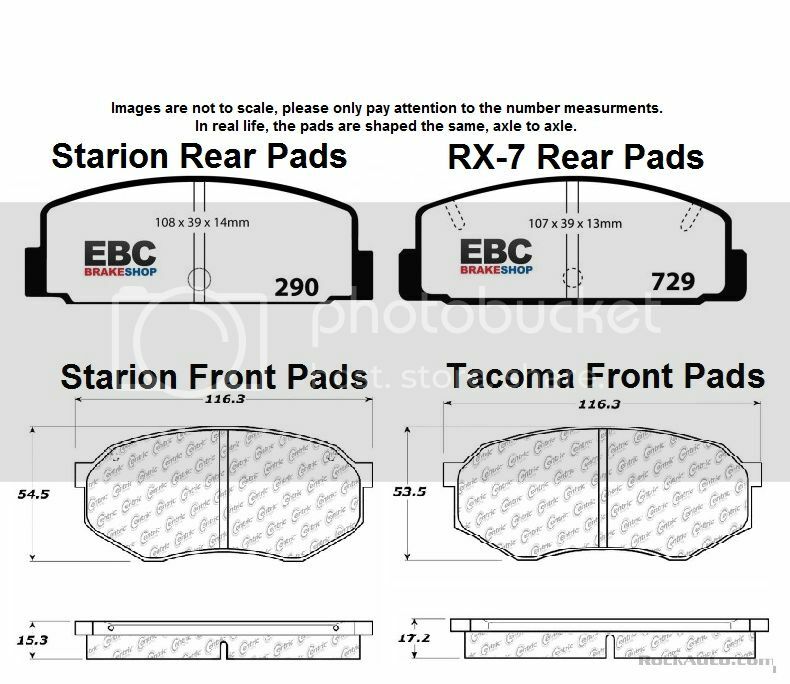 Are there any EBC pads that cross-reference for the rear? Don't think so, they're pretty small. Rear pads are ALMOST interchangeable with FC RX-7 rear pads, so long as you specify rear ventilated discs. 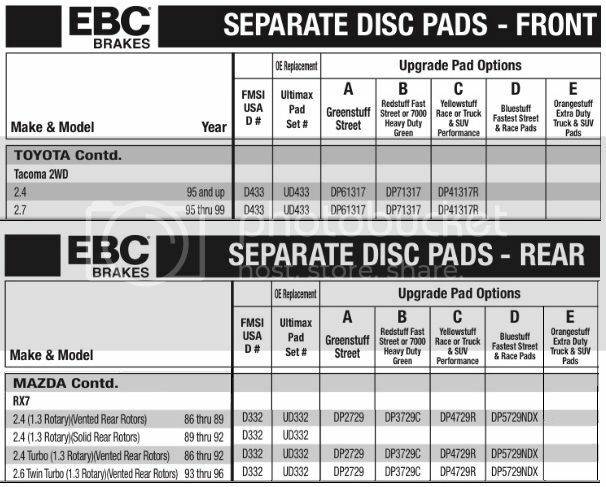 EBC makes all sort of stuff for RX-7's including rear pads. I'm working on a chart, and I'll upload it momentarily. Stand by. Edited by Coke, 20 July 2016 - 11:15 PM. Looks like maybe only a slight trimming of the ears. Excellent find!